Breastfeeding Twins Classes are available anytime! Learn all about our online breastfeeding twins class that you can access on-demand, allowing you to learn on your schedule and at your own pace. Expecting twins? Register for a Twiniversity New York Expecting Twins Class! Our twins classes will prepare you for everything you need to know BEFORE the twins arrive (including what you need to buy!) and AFTER the twins arrive through their first 6 months of life. It’s the perfect way to get ready to bring home your dynamic duo! Register now for our 2-day New York expecting twins classes, offered every month at Twiniversity. Perfect for couples pregnant with twins or with newborn twins. Includes dinner for two for 2 nights, a swag bag (value $100), lecture, and materials. All classes are taught by Twiniversity founder Natalie Diaz. 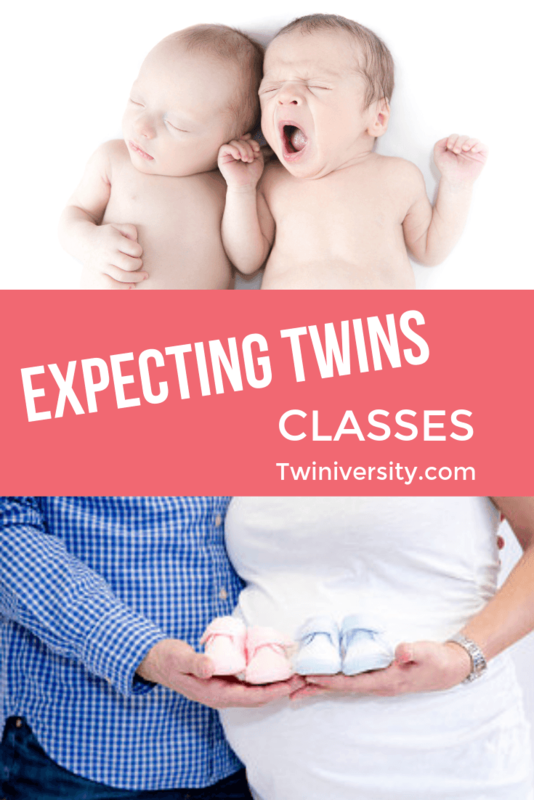 Expecting twins classes are now open for registration for expecting and new parents of twins and higher order multiples living in the Chicago area. Our 2-day twins class will prepare you for everything you need to know BEFORE the twins arrive (including what you need to buy!) and AFTER the twins arrive through their first 6 months of life. Perfect for couples pregnant with twins or with newborn twins. All classes are taught by Twiniversity’s “Wizard”, Julie Burt Nichols. Join us at the largest natural parenting convention EVER! MommyCon NYC is coming up on April 6th and Twiniversity’s own Natalie Diaz will be there as a guest speaker! This multi-day event features amazing shopping, interactive workshops, inspirational speakers and so much more. It’s for expecting and new parents, as well as parents of toddlers and older kiddos. To view the schedule, buy tickets and get more info go to MommyCon.com and use code TWINIVERSITY10 for 10% off, click here! Join us LIVE in Orlando, Florida from the floor of the JPMA Baby Show 2019 to see all the new products coming out from MAM! Nat will take us on a booth tour to show us what’s going to be hot for 2019 from MAM. And, of course, there will be GIVEAWAYS! You can find the live feeds on the Twiniversity Facebook Page main wall! PLUS we’ll be going LIVE all week — Tuesday through Saturday — as we visit Universal Studios, Disney World, and tons of baby gear booths all over the JPMA trade show floor, so make sure your notifications are set to ON so you don’t miss a minute of our shenanigans! We’ll also be announcing a surprise giveaway on Friday so STAY TUNED! If you live in the Orlando, Florida area and you want to attend the New Parent Days consumer portion of the JPMA Baby Show, click here to buy tickets with our special discount! Nat will be speaking at this event! Check the schedule when you arrive, but right now she’s planned to go on at 11:30 am to talk about “Mistakes New Parents Make”. If you’re at the show, be sure to drop by and say hi! Join us LIVE in Orlando, Florida from the floor of the JPMA Baby Show 2019 to see all the new products coming out from Baby Trend! Nat will take us on a booth tour to show us what’s going to be hot for 2019 from Baby Trend. Join us LIVE in Orlando, Florida from the floor of the JPMA Baby Show 2019 to see all the new products coming out from Contours! Nat will take us on a booth tour to show us what’s going to be hot for 2019 from Contours. Expecting twins classes are now open for registration for expecting and new parents of twins and higher order multiples living in the Houston area. Our 2-day twins classes will prepare you for everything you need to know BEFORE the twins arrive (including what you need to buy!) and AFTER the twins arrive through their first 6 months of life. Perfect for couples pregnant with twins or with newborn twins. Includes dinner for two for 2 nights, two swag bags (value $100 each), lecture, and materials. All classes are taught by Twiniversity Writer Crystal Duffy. Expecting twins classes are now open for registration for expecting and new parents of twins and higher order multiples living in the Houston area. Our 2-day twins class will prepare you for everything you need to know BEFORE the twins arrive (including what you need to buy!) and AFTER the twins arrive through their first 6 months of life. Perfect for couples pregnant with twins or with newborn twins.